High winds have the potential to tear shingles from your roof, leaving the roof deck and underlayment exposed to the elements. Wind can also lift and curl shingles by breaking the adhesive seal underneath that bonds them together. 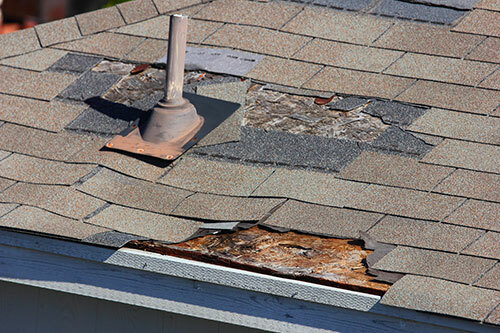 This leaves your roof vulnerable to wind-driven rain and other threats caused by extensive storm damage. New View Roofing is a locally-owned and -operated roofing and home improvement company that services over 1,000 residential roofs annually. Our roof repair process starts with a free inspection. After we assess the wind damage, we’ll come up with a viable solution to restore your residential or commercial property. We can also assist with the insurance claim process and ensure you get the best possible value. When you hire New View Roofing for a roofing project, you can rest assured that we have the knowledge base, high standards and skillset to handle any roofing task. Our partnerships with top-tier manufacturers allow us to install the best products the roofing industry has to offer. As a GAF Master Elite® Certified roofing contractor, we have completed extensive training to achieve this status and continuously strive to meet the demands of our growing clientele. We’re committed to open lines of communication, careful workmanship and personable customer care. After a storm hits your home, it can be overwhelming to know where to start with the restoration process. New View Roofing offers services in hail and wind damage repair to restore your property and protect it from future damage. Find out why we’re a cut about the rest! Schedule your free inspection by calling us at (469) 232-7220. You can also fill out our online form and one of our friendly representatives will respond to you with 24 hours.